Australian Landscapes: Stereo Aids - Manufacturers of Mirror and Pocket Stereoscopes. Publishers of 3D Imagery. Gives students an opportunity to study various aspects of Human and Physical Geography and Environmental settings interactively. Three major cities are covered in detail with a wealth of information and activities. All other locations covered have student activities to help students achieve a wider understanding of that particular environment and practice many geography skills. Detailed inner city study of Sydney, Melbourne and Perth. 26 locations, covering all aspects of geography and the environment. True 3D viewing (ScreenScope required). Interactive activities on all areas. 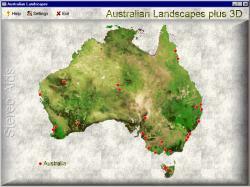 Australian Landscapes includes 26 locations around Australia. 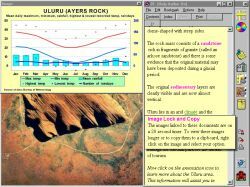 Each location can be studied using two viewing methods; Stereo View and Single Image View. 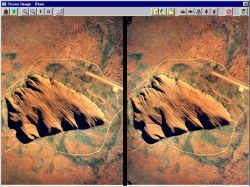 Stereo View, enables students to visualise vertical aerial photographs of the selected location in true 3D at their desktop using the ScreenScope. By using stereoscopy students are able to develop an understanding of the environmental features of the location and how it relates and interacts with human activity. The zoom feature allows detailed study of the location under investigation.